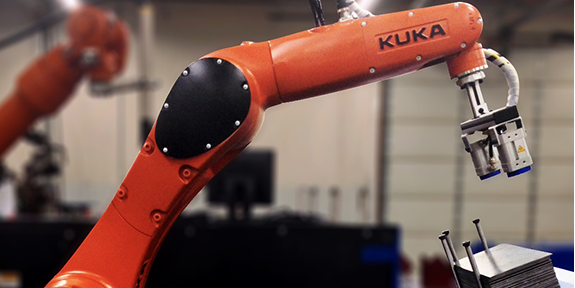 From small pre-engineered welding cells to large integrated systems, KC Robotics creates individual automation solutions to fit each customer’s needs and level of expertise. 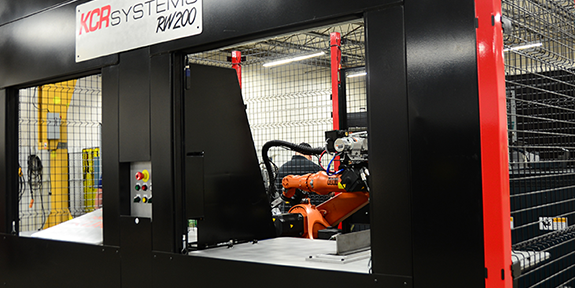 Our robotic systems include design and engineering, programming, safety enclosures, custom End-of-Arm tooling (EOAT), system build and training. The latest technology in vision and laser touch systems is available when needed. 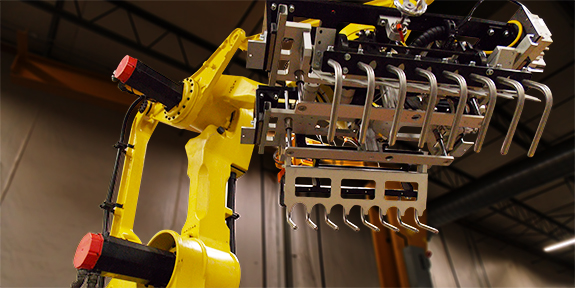 KC Robotics designs custom solutions for a variety of applications, including arc welding, material handling, material removal, ultrasonic cutting, and machine tending. Non-Traditional Applications – Through our relationships with USAF and NASA, KC Robotics has built systems for custom labs and vacuum chambers. Our expertise now extends to nuclear site systems with the DOE. Choose an integrator with extensive expertise in Arc Welding. KC Robotics’ welding specialists are certified welders as well as robotic programmers who understand the welding process. We provide the expertise to keep you competitive with clean welds and an efficient system. KC Robotics specializes in Material Removal. 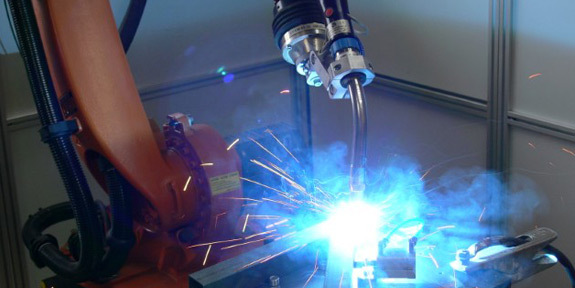 Our expertise includes robotic routing and grinding, ultrasonic cutting, and plasma cutting. A good system will improve your employees’ safety and provide clean, efficient cuts. 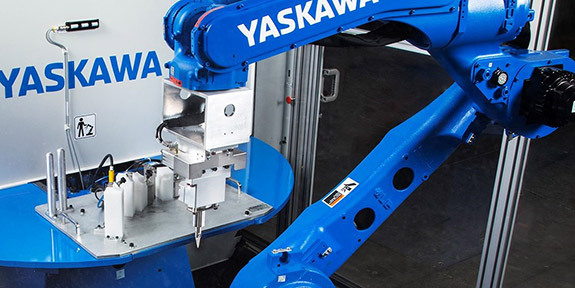 KC Robotics’ Ultrasonic solution includes high speed Yaskawa Motoman robots and patented ultrasonic knives and routing tools. This application expands the limits or conventional robotic cutting with a clean and versatile alternative. KC Robotics creates Material Handling solutions to integrate with a customer’s existing lines that will improve safety and productivity. Our experience includes simple pick-and-place parts transfer as well as palletizing with custom conveyor design. 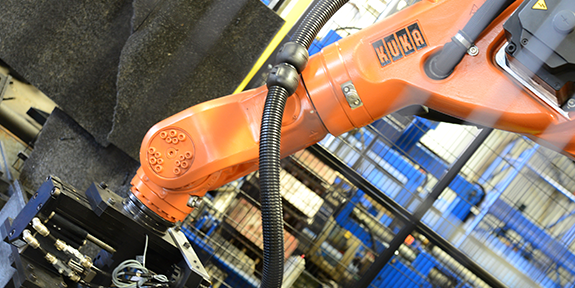 KC Robotics’ machine tending automation provides manufacturers with a safe and efficient solution to loading and unloading parts. 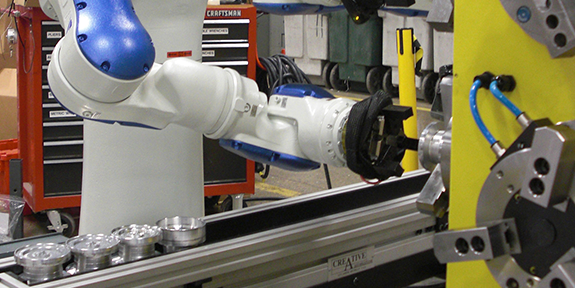 Our cost-effective robotic systems and custom end-of-arm tooling increase productivity, accuracy, and safety. Palletizing systems from KC Robotics are flexible and efficient solutions for manufacturers looking to replace manual labor or update their automated palletizing system. Our solutions are fully equipped from conveyor to tooling and install seamlessly in any production line. KCR Systems Pre-Engineered cells provide an economic solution for standard welding and trimming operations. Each cell contains a modular system of standard components, pre-assembled for customers looking for a ready-to-use system. 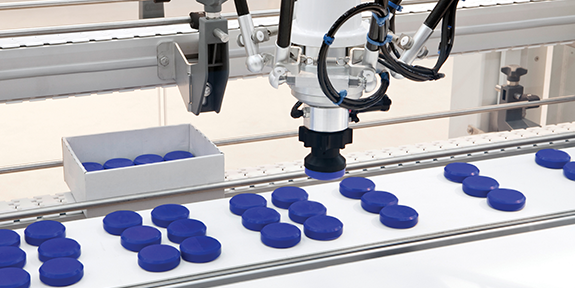 Vision guided automated systems are a great option for manufacturers who need a sorting, feeding, inspection, detection, or quality control application. KC Robotics has installed both simple and complicated vision systems. With our expertise, we can help you determine your needs.